The morning of the race was excellent, calm ocean, no wind and in the 70’s. We took a cab to get there at 5.15am. Only a 15 min ride. You can take the metro too, but it’s a bit more than 1/2 mile walk to the beach. My transition was set up next the Pros, second row from bike out. Pretty cool with AWA benefit. Ed, my husband was with me, to wish me good luck, and I was waiting to see my brothers Richard and Daniel and my cousin Jacob and my friends Agnes and Riley. But I didn’t see them until after swim. I thought it was a pretty cool swim system. Everyone had to put themselves on a preferred swim time and then we were boxed into the certain time area with different cap colors. 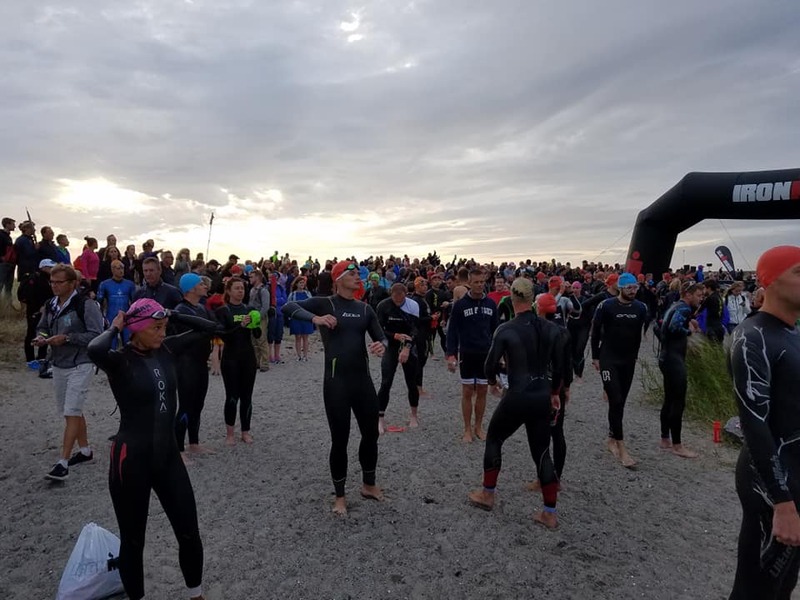 The swim was surprising pleasant, about 22 degrees C, (71F) and it was very shallow so you could see the bottom with seaweed and some fish, and a crab, but it was not totally clear, then perhaps it was because 2,800 athletes was swimming along, ha. I started off strong, I kept my pace even. we were spaced out pretty well, I never really had any bump ins, except around the turns. It was wetsuit legal and swimming in Saltwater was a different feeling, my legs floated almost above the surface. It was one big loop, and I felt strong for most of the way until the last small turn where it became very packed and I was getting tired. My arms started getting numb, and I felt a minor cramp in my legs, but I was still swimming strong. 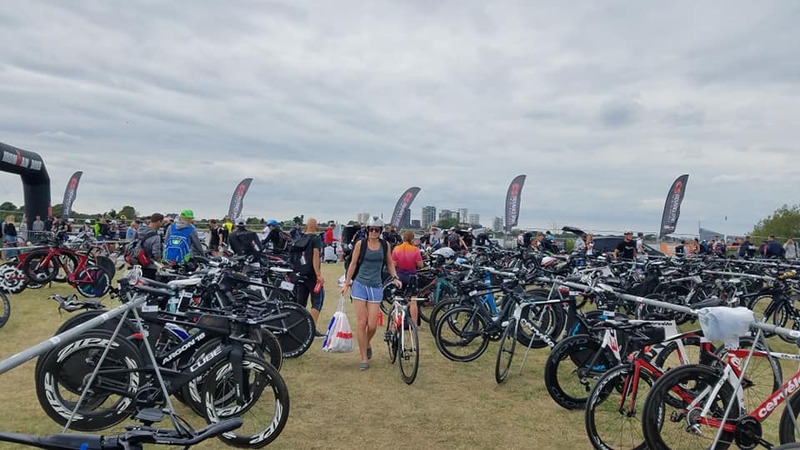 I’m glad in this race I never bumped into any breast strokers, I had seeded myself pretty well. Swim 1.19hr. 4th place. The bike course was awesome with mostly flat and some rolling hills. I’m so happy I bought new race tires, the ones I had were very thin and these new ones are more suitable to the environment. The roads in Denmark contain flint stone and they are very sharp especially when it rains. I did not want to risk a flat. We started at the beach and dwindled into the city, across cobblestones, several turns, but it was good marked. The crowd was cheering alongside the roads. After about 20 km, (35miles) we ended up on the Strandevej, beach road, and it was so great to see the ocean, there was a slight wind, but very minor. (Not like in Cozumel where a monsoon storm started during my bike ride.) lol!! 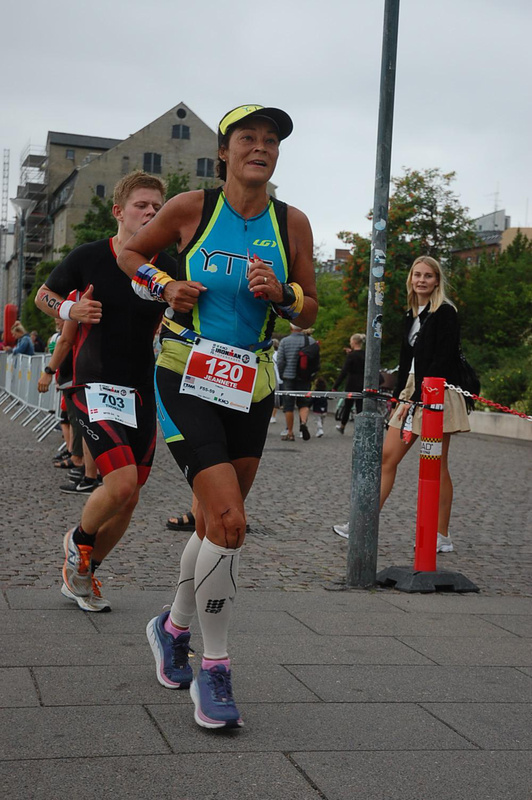 I wore only my arm warmers and I was totally fine, it’s been a heat wave during the summer in Scandinavia and we caught the end of it. The course was two loops around the coast and inland. The northern part was country side and rolling hills, very pretty and my mind was happy and present to keep myself not getting bored. My main mantra was for the whole day “I am number One, I’m strong and I will be number One”. I also sang “It’s a long way to Tipperary, its a long way to go”…. I have no idea where that came from but it amused me. Hehe!! I was relaxed and I was riding strong. Right at the start coming out from T2 my friend Agnes was there yelling that I was 1st on the bike and in a 20 min lead from second. The run course was four laps. 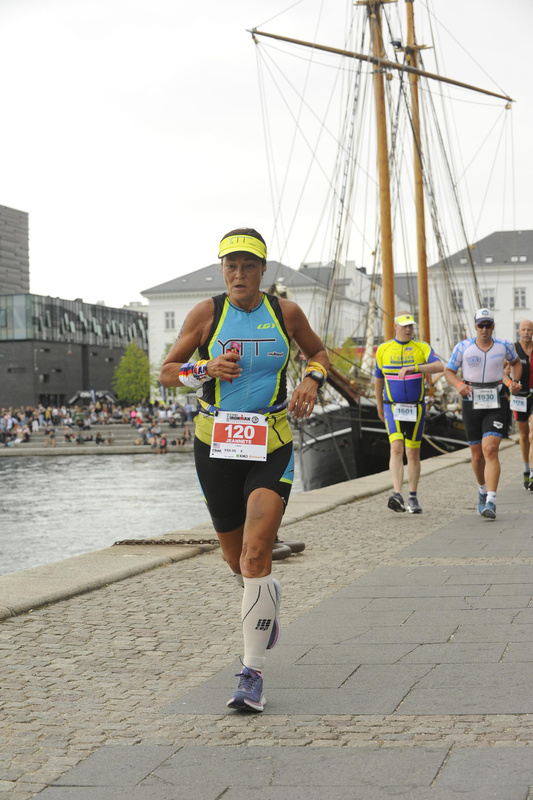 We ran from Ofelia Plads up north to where the cruise ships were docked, passed the little mermaid and back south. Cheering crowd and runners everywhere. It was mostly overcast, sometimes sun and temperature in high 70’s. I felt it was perfect, if I only had not been injured. to my youngest (my singing TBI child) deciding to study in South Korea this fall. 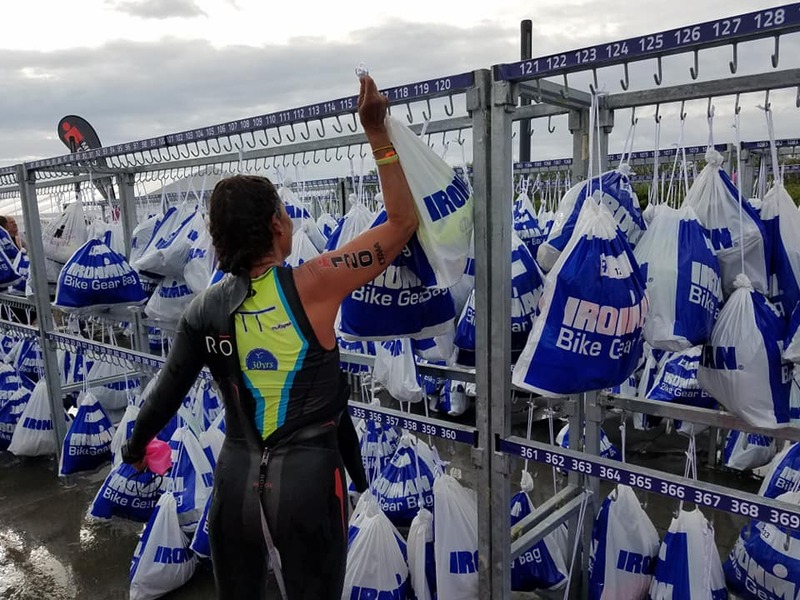 My husband changing work, and to myself, who has now done two more Ironman since, and the last one was Ironman Louisville, where I placed second in my age group. (and no I did not make Kona, I have to win my age group). And finally I believe I have found my life purpose. That is to give service, support, help and love to people who wants it. I’m a entrepreneur, and I have always been, but it’s first now I realize I can pursue my dream by focus and change my mindset to a positive lifestyle and wealth. More to come. 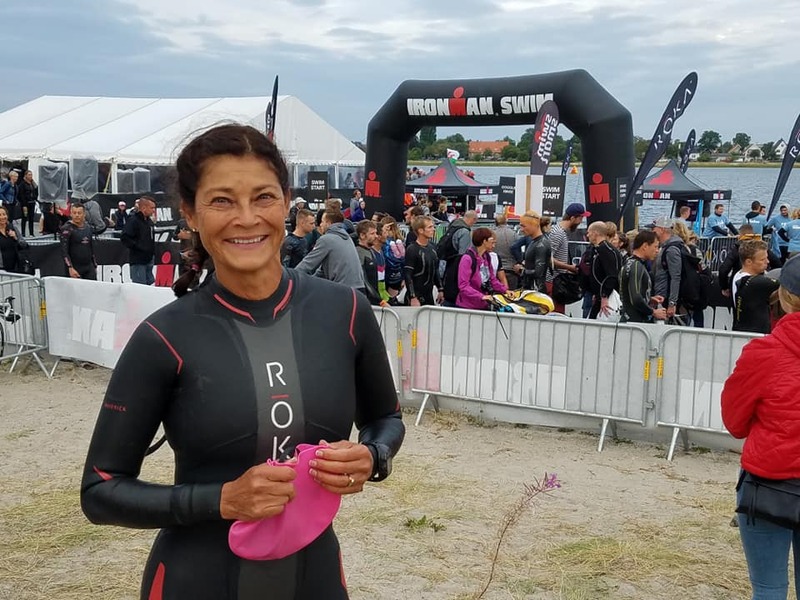 This entry was posted in Uncategorized and tagged Family, goodlifeafter50, happy, Ironman, Wellness. Hello, today is my day three with Bradley Will, the entire 30 Days of Content, to learn to blog. 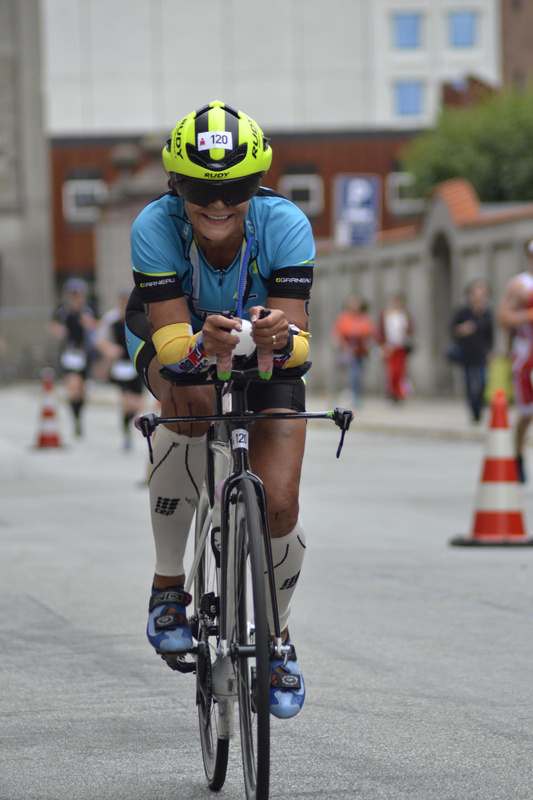 I’m an Ironman athlete and I have done four ironman. 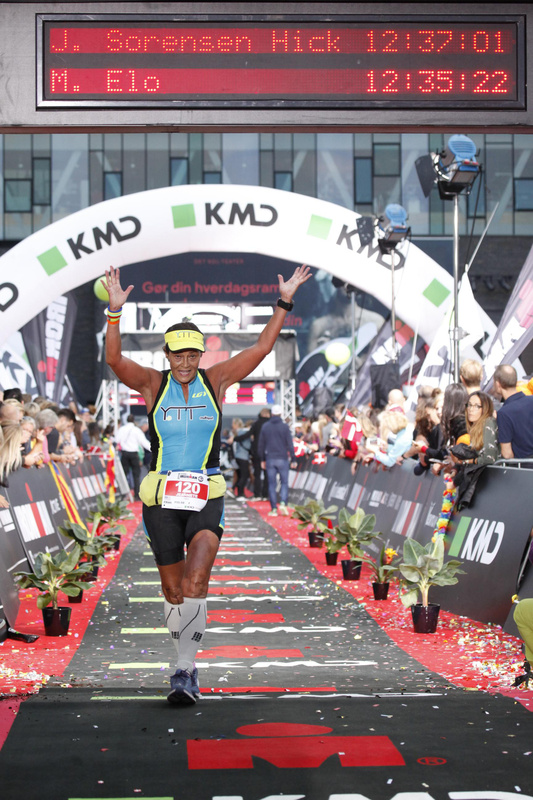 My fifth will be in Sweden, in August 2016. 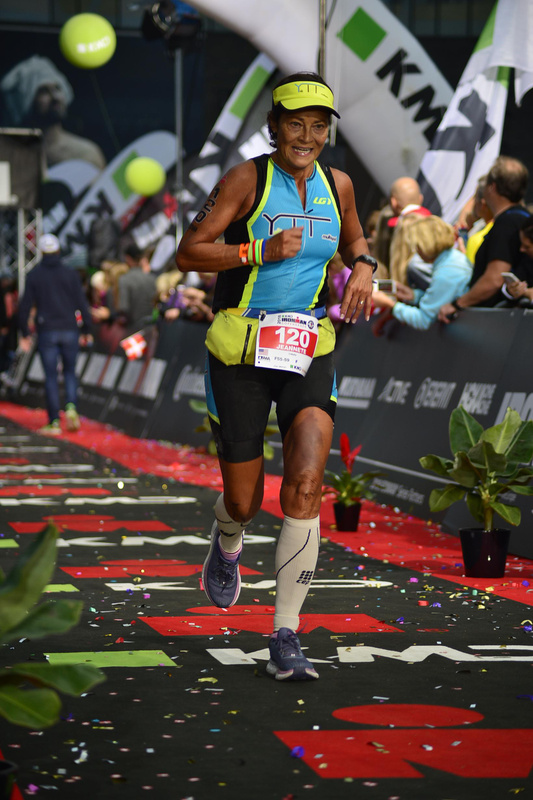 I would like my blogg to be about healthy living and my training, my triathlon experiences, and that life is not over after 50. However, now when I’m sitting here trying to write, I’m listening to the news, and all I can think of is the horrid terrorist attacks that’s happening around us. I’m thinking of Paris. My homeland Sweden, where I grew up in, is in state of High terrorist alert level four out of five. Because a terrorist escaped from Paris and entered Sweden. I think of my family and friends there and suddenly all the threats and terrorist attacks become much more real. Reality is our world is changing by evil itself. We are not safe anywhere. But despite this, I want to write about my life and how fortunate and grateful am I can do what I do. 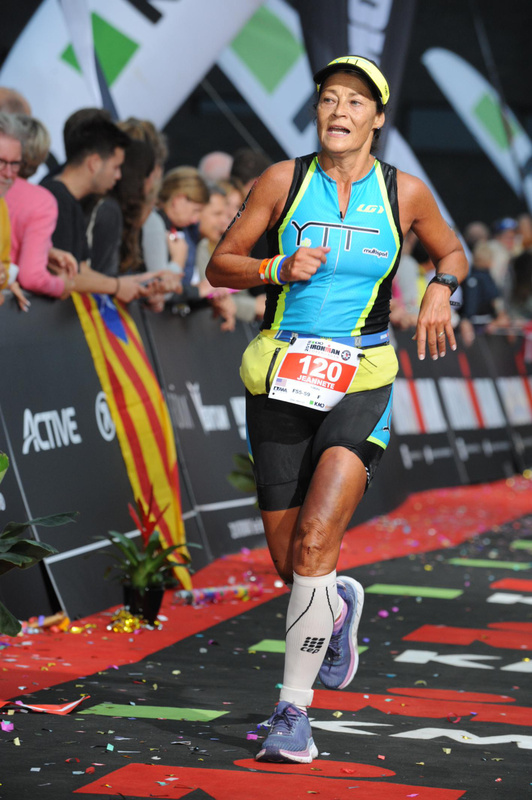 That is, to race Ironman triathlons and coach other athletes, and continue to share a healthy living all over the world. Peace! 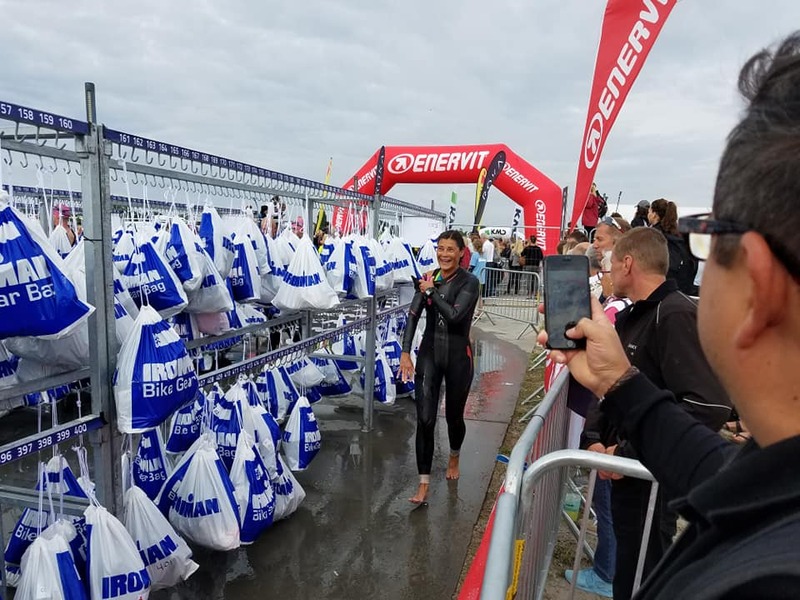 Anyhow, much has has happened since I last blogged about Ironman Frankfurt. 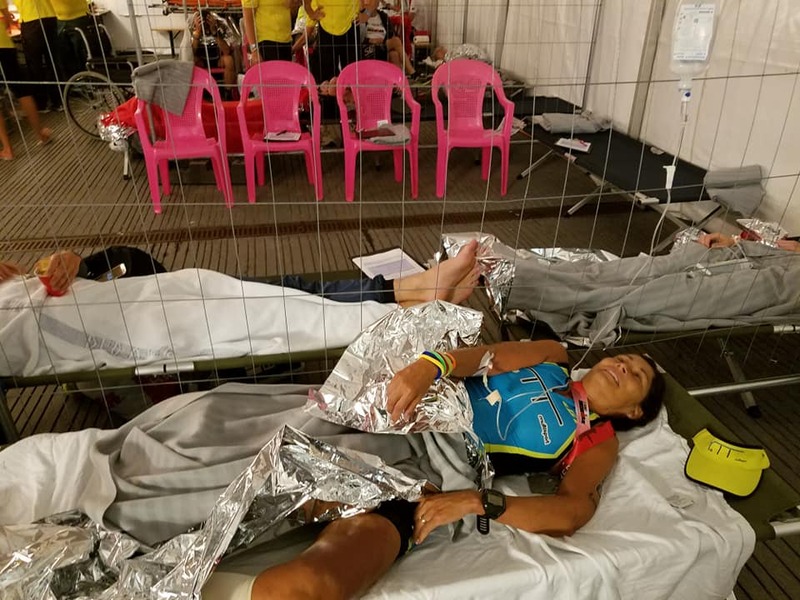 I did a couple of shorter triathlons and the R&R half marathon. In the Boulder sunset sprint I placed 2nd in my age group. On the 1/2 marathon I missed sub 2hrs with 3min. Next timeI’ll get there. I’m still going to Physical therapy twice a week. A whole year since the car accident and I’m still struggling, ugh. 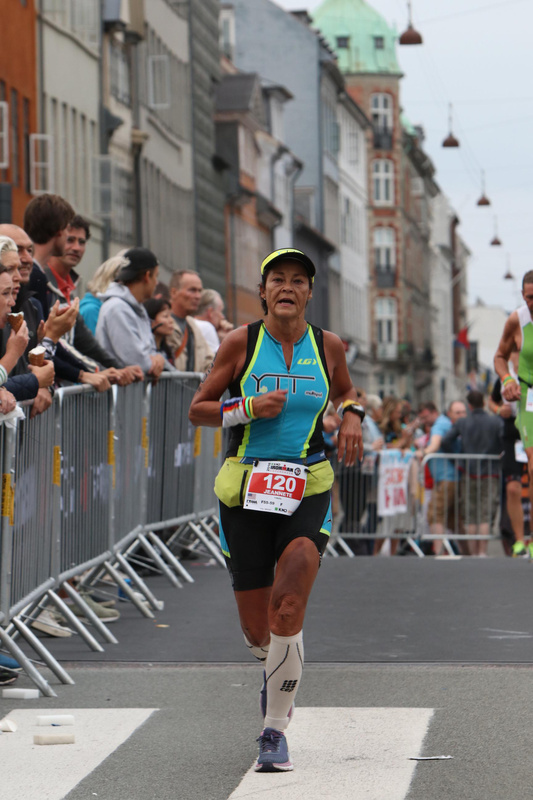 In end of December I will start training for Ironman Kalmar. I need to be all healed by then. Todays planned 100 miles ride was cut short at 55 miles when I got hit by a car. 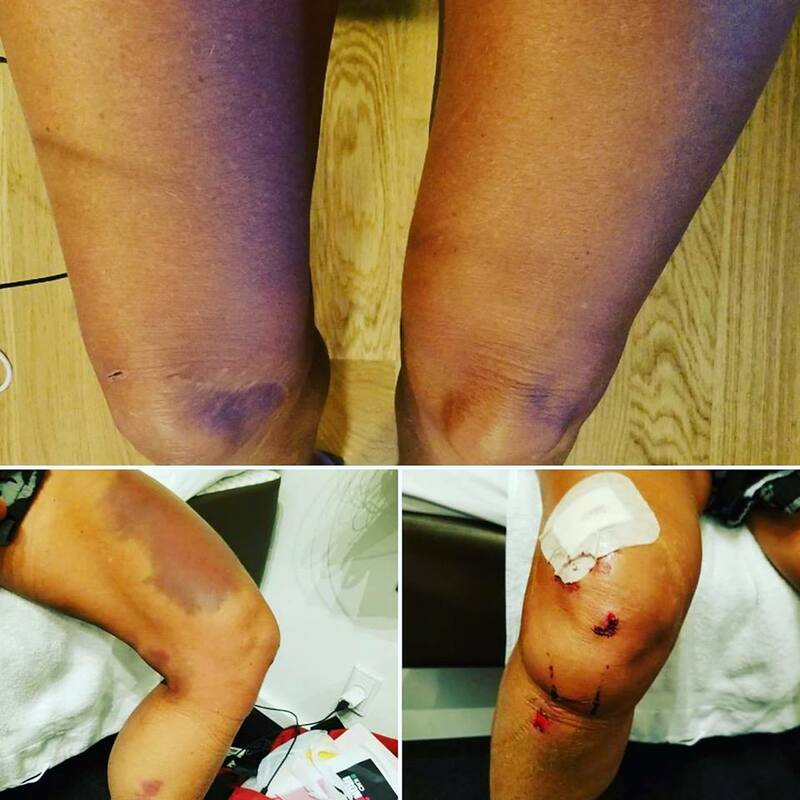 Just three weeks after the other bike accident. I was riding the Boulder course with coach Yoli and my team mate Evelyn who was sag wagon. The weather is beautiful and the sight is very clear. I saw the car and thought for sure the driver had seen me. The car was at a stop sign to the left of me, and I had the right away. No other cars were around. Coach Yoli was about 50 meters ahead of me. I was riding 24 miles/hr, yes actually one of the few times I reached that speed on a flat road. 🙂 Suddenly the car accelerate out in front of me, I reacted by instinct and swerved right but couldn’t get away from the car fast enough. The car hit me on my left side, I flew on top on the car’s hood along with my bike and then fell down to the ground. The car stopped, Thank Goodness. The driver came out and said she never saw me and she apologized for hitting me. (Later she told the police she barely hit me and that I fell on top my bike, whatever!! ) The ambulance came and took me to ER. Again!! Life doesn’t always go the way you want sometimes. I’m starting to wonder if I’m part of the “Final destination” movie without knowing it!! Ugh!! This entry was posted in Uncategorized and tagged #tritraining, 50+ and still getting stronger, IMBoulder. 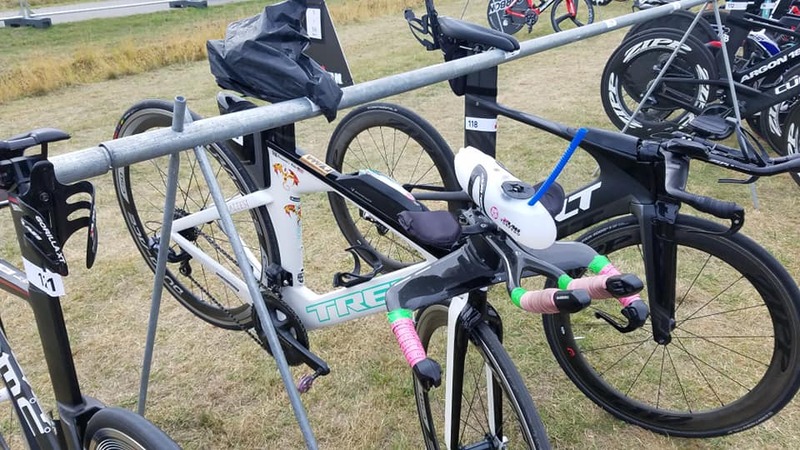 This entry was posted in Uncategorized and tagged #tritraining, IMBoulder, IMtraining, over 50.